The memory modules below are 100% compatible with your Alienware Area-51 7500 (DDR3) Desktop. Not your model? 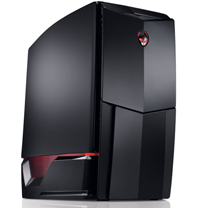 View the complete range of Alienware Desktops or view all Alienware upgrades here. The magnetic recording devices that have been widely used across the world for a number of years are an evolution of ‘magnetic wire’ recording that had its origins way back in 1898, as the first rudimentary hardware was designed by one Valdemar Poulsen. Using a steel wire, pulled quickly over a recording head, a magnetic force is created along it that reflects the level of polarity and intensity of the signal being supplied to it. When this same wire was drawn across the read head, the same magnetic field was representative of the original ‘data’ stored on it, albeit at a reduced level of signal. Order within the next 4 hours, 10 minutes, and select Express Delivery.